Horseshoe Top-End is a scenic, sheep property and has been home to five generations of the Connell family. Diversification in to tourism has enabled them to pursue their passion and protect areas of vegetation for future generations to enjoy. Teresa and Jim invite you to explore the unique environment of Horseshoe Range – a miniature Wilpena Pound. Only 330 kms north of Adelaide in the Horseshoe Range (26 kms west of Carrieton or 50 kms east of Wilmington and Quorn). Homestead with modern amenities. Sleeps up to 12. Stunning views of Horseshoe Range from the comfort of the lounge room or verandah. Private bush campsites (at least 1 km from homestead and other campsites) suitable for large or small groups. Each site has their own eco friendly ‘odourless’ toilet. All sites have access to a modern shower block. 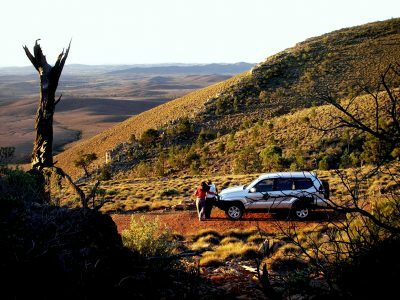 4WD self drive tours and walking/mountain bike trails with stunning panoramic views stretching from Mt Remarkable to Wilpena Pound. Escape back to nature at Horseshoe Top-End. Walk, drive or ride our many tracks and enjoy the beautiful views and wildlife. Capture stunning landscapes on camera. Check out sunset at the lookout with wine and nibbles and relax at the end of the day around the campfire under the magnificent stars of the Flinders Ranges.